I think the Tampa Bay Buccaneers have a salvageable look. To me this set has an amazing colour balance; the way the brighter red pops with the pewter and orange just looks so good. Change the still-terrible number font and shrink the logo on the helmet a bit, and I think their uniforms become among the best in the NFL. I like the helmet, simplify the number font and you’ve got yourself a home run. The pants striping is also a bit iffy. This set does have a good color balance. I actually don't have any problem with the oversized helmet logo myself. The number font is dumb like you mentioned, and matte pewter just looks like someone tried to combine black and brown. If they could give their pants and their shoulder yoke a proper sheen and change the number font, they would look good. But right now no company can seem to give the newer uniform materials anything but a matte finish, which I think is an aesthetic shame. 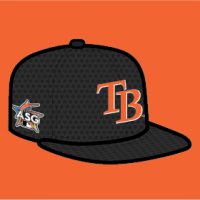 Does anyone else have an issue with the Tampa Bay having 1. Two different logos on two different sleeves and 2. The one logo says “Bucs”? This set has quite a few good things going. The colors looks nice and the shoulder yoke and pants design actually work well in tandem. Moreover, the way the uniform has tended to be worn, pairing the pewter pants with a red design with red socks and the white pants with a pewter design with pewter socks meshes incredibly well. Like many of Nike's designs, its a simple case of over-embellishing an otherwise interesting core. Fix the numbers and shrink the helmet logo and they've got a modern classic. I wouldn't have thought it possible, but yes I agree. Change the numerals, reduce pirate-flag helmet logo by 1/3, and clean up some of the trim - maybe lose the orange and add a bit of black - and voila! The pewter-scarlett color balance is quite good. The TB Bucs have disgusting uniforms, the colors are all over the place and they can't even logo properly. Yes and yes. I can’t think of anything that they improved. The color-balance was better in the past. Number font, obviously. It was a terrific combination of classic style and modern colors. Now it’s modern colors and Nike-style meant to grow stale. The color balance absolutely was not better in the past. 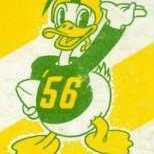 There was no pewter at all on the jerseys in the '90s set. Pewter was and is their unique color, yet they managed to leave it off the jerseys entirely in favor of generic red and black. Their current uniforms are a big improvement in that regard. The Washington Capitals have never looked better than this. The "federal" color schemes of the Caps and Wizards were great because they were DC-specific without being generic RWB. 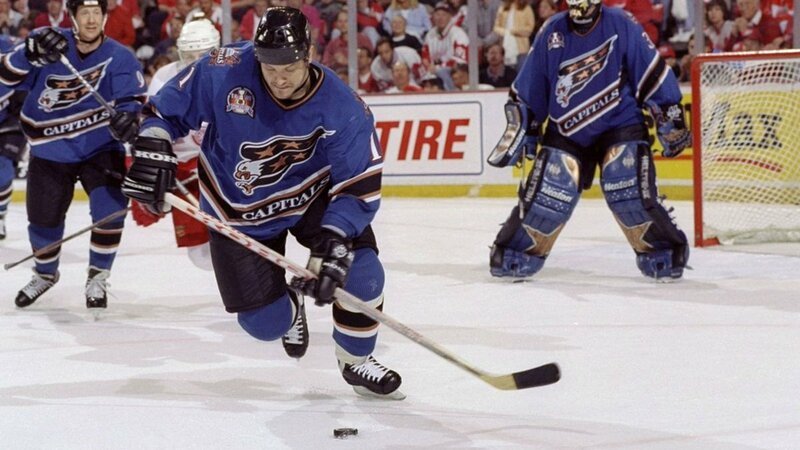 Unpopular opinion...I thought Starter NHL replicas were garbage when they came out in the 90's, and I still have no idea why people look back on them with fondness today. They were stretchy, and I'm convinced that present-day counterfeiters bought the excess stock of crests and patches to put on the jerseys they're selling now. The Padres brown uniforms are a bad look, and the Hartford Whalers uniforms are overrated as well. The NJ Devils don't look good in red and green. I am enamored with these - though I love their green kits, too! Count me in: the only problem I had with the federal look for the Caps was the screaming eagle logo. For some reason it just seems boring and flawed. To be fair though, i’ve Yet to see a suggestion or a concept in the federal colors with a better logo. Maybe the Weagle? I’m not sure. 1. I think hockey should go back to white home uniforms and color roadies. White at home, I agree ... for among other reasons - a team's home court games can take on a monotonous look when visiting teams always wear white, and the homies are always in the same colors every night. Absolutely. Someone in another thread (maybe this one, I forget) recolored the Weagle to black and bronze and it looked really good. 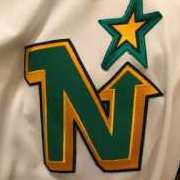 Slap that on a blue and bronze jersey and you have yourself a modern classic. I remember TRoyConcepts did a really good job on the Caps a few years ago with blue and bronze, although the uniform had the Screaming Eagle on it.